New DC TV Show to Be Announced Soon, What Is It? It's not hard to argue that DC TV is doing way better both critically and with fans than the cinematic side of this comic book universe. 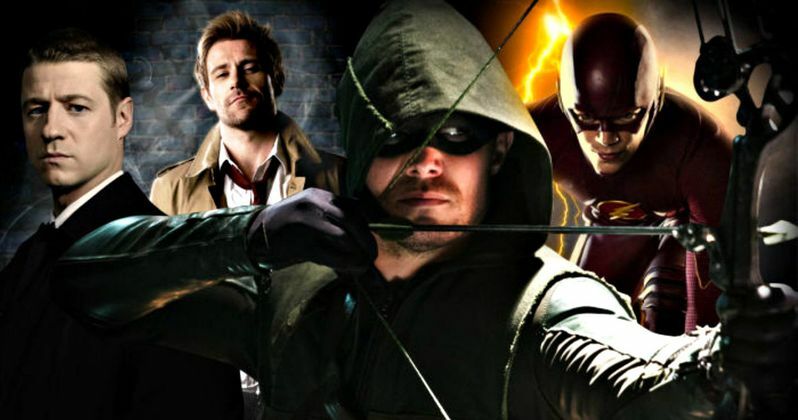 The CW has a stellar line-up already running throughout the week, with The Flash, Arrow, Supergirl and Legends of Tomorrow dominating the small screen landscape when it comes to superheroes. And Fox is doing a bang-up job with Gotham and Lucifer. Soon, a new DC TV Show will be announced. And what it is, is anyone's guess. DC Films boss and President/Chief Creative Officer of DC Entertainment Geoff Johns announced via his Twitter this New Year's weekend that DC is getting ready to unveil a brand new show. No title has been given yet. And it's unclear if this will be The CW's fifth superhero show, or if it will air on Fox. It could also be for one of the three major networks. No one is quite clear on that fact just yet. Also airing on The CW is DC's iZombie, but that show doesn't currently fall into their superhero line-up, though a crossover with any of those various shows has never been fully put to rest. Falling under DC's Vertigo banner, it could still get a crossover of some kind. Also not in the immediate DC Comics wheelhouse, yet produced by the company is Preacher, which airs on AMC. DC is also developing Black Lightening and Krypton, which could both arrive in the New Year. On the movie side of things, DC has been humming along with its proposed DCEU. Back in 2013, they kicked things off with The Man of Steel. Then last year they released Batman V Superman: Dawn of Justice in March, followed by Suicide Squad in August. Though both movies were financially successful on some levels, neither really managed to resonate with critics, and fans were evenly divided. There are seven more DC movies planned before the end of this decade. And there are rumors of more being added to the slate. Will one of the movies and this upcoming TV show overlap? That's possible. Geoff Johns would only say this for the time being. "5) More #DCTV @CW_TheFlash @CW_Arrow @Gotham @TheCW_Legends @LuciferonFOX @TheCWSupergirl and many more! One which will be announced soon..."
Soon is pretty generic, and it could mean days, weeks, perhaps even months before we learn what this show is. While everyone waits for the big announcement, we're sure to hear plenty of fan theories and rumors sprout up. Some already believe this new show will tie directly into the Arrowverse. Others think it's the much anticipated Booster Gold series, which was supposed to debut on the small screen years ago. And then there is Rip Hunter, who returns to Legends of Tomorrow this month after fans thought he'd perished. Many believe he'll get his own spin-off at some point. But that's certainly not a forgone conclusion. Geoff Johns went onto confirm over the weekend that he was going to start writing actual comic books again sometime in the New Year. He also teased images from Wonder Woman and Justice League, as well as a sequel to the video game Injustice. Over on Fox, Lucifer and Gotham are back for all-new episodes starting January 23. Supergirl flys into new episodes starting January 23. The Flash and Legends of Tomorrow return to The CW on January 24. Arrow is back on January 25. And later in the year, iZombie comes back hard starting April 4th. As for the big screen, Wonder Woman is debuting in theaters June 2, with Justice League to follow November 17.